Comeback Kids – The Chicago Blackhawks still are alive in the race for the Stanley Cup Playoffs, and they have a couple of their younger players to thank for it. James Wisniewski scored to erase a 3-2 deficit with less than a minute to play in regulation, then rookie sensation Patrick Kane scored 69 seconds into overtime as Chicago pulled to within four points of No. 8 Colorado with a 4-3 win against the St. Louis Blues on Sunday at the United Center. The Blackhawks – who haven’t reached the postseason since 2002 – have six games remaining. They return to the ice Wednesday night at Columbus, where Chicago coach Denis Savard once again will rely on younger players such as Kane (19) and Wisniewski (24) to keep his club in the race. "They know what it takes to win, to battle," Savard said of Kane, a Calder Trophy candidate, and Wisniewski, who ended an 18-game goal drought. "Whether we get there (the playoffs) of not, they'll prove a lot of people wrong." Meanwhile, the St. Louis Blues’ nine-game road trip has ended with a 1-6-2 mark, and they are on the verge of missing the playoffs for the third year in a row – something that never has happened in the 41-season history of the franchise. 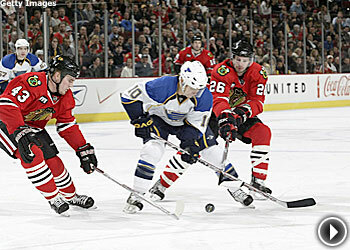 The Blues play at home for the first time since March 4 on Tuesday night, when they host the Detroit Red Wings. Welcome home, fellas. "We've competed in every game with the exception of one," St. Louis coach Andy Murray said. "Our team competes hard on a nightly basis. What we need to do is find a way to turn these losses into wins because our compete level is pretty strong." 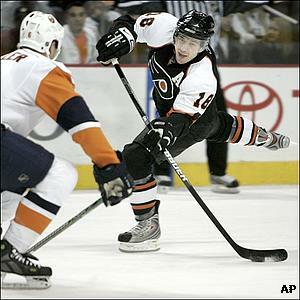 The Flyers' Mike Ricahrds gets a slap shot past Matthew Spiller of the Islanders last night. Movin’ On Up – With the Montreal Canadiens sitting atop the Eastern Conference, the Philadelphia Flyers likely are doing everything they can to avoid facing the aforementioned Habs in the opening round of the Stanley Cup Playoffs. Why? Well, the Canadiens did go 4-0 against the Flyers this season. But after Sunday’s 4-1 win against the New York Islanders, the Flyers are in seventh place in the conference. The Flyers have won three in a row and moved two points ahead of the No. 8 Boston Bruins with Sunday’s victory. A nice chunk of their turnaround this season can be attributed to the play of goaltender Martin Biron, who made 32 saves and improved to 6-0 this season against the Islanders. The Flyers’ power play certainly gained some confidence against the Islanders, as Philadelphia scored three times with the man advantage. ''I just like the energy in our game we're starting to play with,'' Stevens said. It certainly was visible Sunday night, as the Flyers saw to it that the injury-depleted Islanders would not play spoiler in their barn. With Rick DiPietro done for the season and a game against the Pittsburgh Penguins looming Monday night, Isles coach Ted Nolan gave Joey MacDonald the starting nod in goal against the Flyers. The loss officially eliminated the Islanders from playoff contention. Will Peter Play? – With a crucial game against the Calgary Flames at the Pepsi Center on Monday night, the Colorado Avalanche are hoping center Peter Forsberg will be able to return from a groin injury. Forsberg – who hasn’t played since March 17 – skated with the Avs on Sunday. Colorado currently is two points ahead of the Nashville Predators for the eighth and final playoff spot in the Western Conference. Who Do You Play For? – On Sunday, Dallas Stars coach Dave Tippett gave his club the kind of skate similar to the one Herb Brooks put the U.S. Olympic team through nearly three decades ago. That’s what happens when you win once in your last eight games. And with the scorching-hot San Jose Sharks looming Thursday, Tippett was forced to send his club a message.